Having a child means lots of baby clothes. But hey, just because they’re little doesn’t mean they shouldn’t dress like the punk rocker within! Having a little kid means you will have sooo many things to explain and teach it. So, maybe baby clothes and fashion isn’t a number one thing on that list. It maybe isn’t an absolute life priority, but it will certainly make things more interesting. All the big fashion designers keep giving more and more attention to kids clothing. That’s great for the kids. But what’s with the smallest ones? Well, these days babies are also having wide and interesting clothing choices. I guess the era of blue for the boys and pink for the girls is a matter of past. 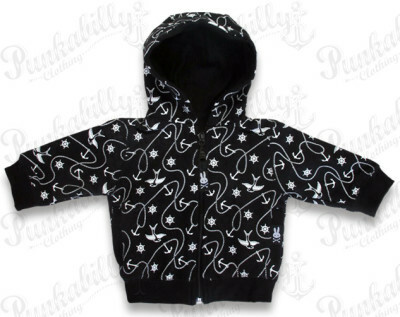 Now, let’s meet a completely different baby fashion style and have a peak into a wonderfull world of punkabilly clothing. 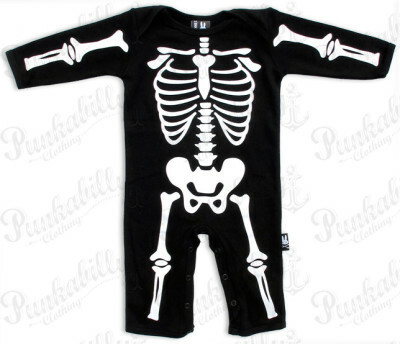 Punkabilly clothing shop tries to follow all the rockabilly and punk style fans, so here is a special page only for baby clothes. These clothing pieces are full of rockabilly style spirit, punk style symbols and unique humor. Not to mention the cuteness! It’s important to teach your child how to be unique from its first steps. That’s what this category offers – originality and cute rebellion. It brings the usual baby bits in an unusual way. 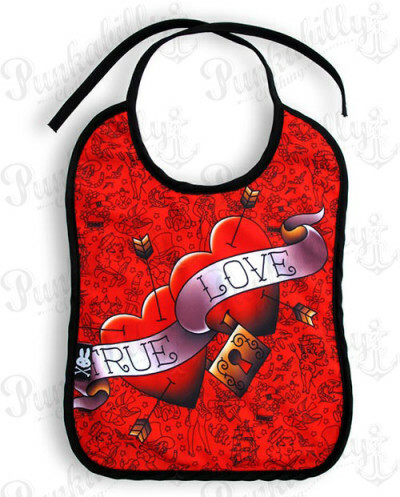 Baby bibs, onesies and jackets are much cooler when you add rockabilly and punk style. 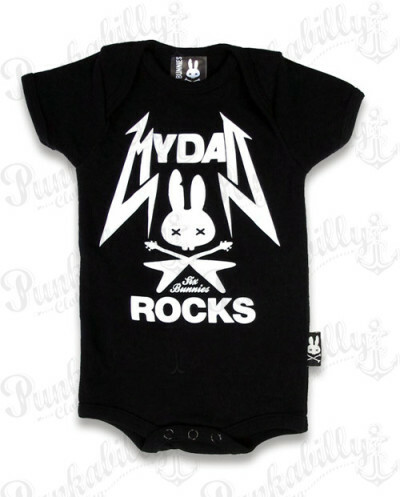 And rockabilly and punk style are much cooler when they’re placed on baby clothes. This punkabilly category presents you Six Bunny models with different punk and rockabilly motives, such as tattoos, skeletons, roses, tuxedo prints, leather jacket prints etc. What’s most important is one special ingredient – all the cuteness of the world! When it comes to memories, we always like to remember the crazy ones. The best photos are funny ones. That’s what makes this unique baby rockabilly style collection a perfect material for best childhood memories. Your child will always be proud to be so unique and awesome baby. Maybe it will spark the love for punk or rockabilly music – to make the awesomeness double! But let’s leave punk and rockabilly aside and get back to the general kids fashion. Childhood is supposed to be careless and happy time. Fashion seems too serious for those tiny years. But not necessarilly! If we keep things funny and interesting, if we use fashion to make childhood only more cheerful, then it’s perfectly meaningful to include your child, step by step, into the exploring of fashion possibilities. It’s not about the ridiculously expensive things which will soon be overgrown. It’s about sensibly affordable pieces which will become a wonderful childhood memory. Affordability, originality, high quality, rockabilly style, punk style – it’s all on one page and it is waiting for you to fall in love with it! Why delay the making of unique style? Your kid will be grateful for the opportunity to be unusual and special. Developing individuality is very important and you certainly wont be wrong if you help your child to learn it. Good luck with exploring kids fashion and don’t forget that we’re saving much more awesome stuff for you on our pages. Retro fashion – Why is it still so popular?